Surrey, BC - The Surrey Eagles Hockey Club is pleased to announce that the team is joining together in a partnership with the Semiahmoo Minor Hockey Association. The agreement will feature many benefits for both the Birds and SMHA. Eagles players will mentor minor hockey teams during the upcoming season and participate in their practices while Peter Schaefer and the Eagles' coaching staff will mentor and host clinics. "We're excited as an organization to be partnering with Semiahmoo Minor Hockey and becoming more involved in the community," said Eagles President, General Manager and Head Coach Peter Schaefer. "With 1,000 members in the minor hockey association, our players and staff are looking forward to working with the SMHA to help impact the lives of these young hockey players in a positive way." Off the ice, the two organizations will co-host fundraising events while both sides will also have the chance to enter into joint sponsorship opportunities. In addition, the Eagles will provide all members of the minor hockey association with a 25 per cent discount on season tickets, and the SMHA will receive 25 per cent of the revenue from every season ticket sold to one of its members. 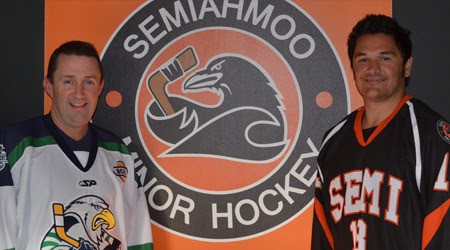 "Semiahmoo Minor Hockey is delighted to be partnering with the Surrey Eagles this coming season," said SMHA President Ian Maguire. "This is a natural partnership within our community and provides an ideal avenue for our budding hockey stars to interact and learn from the best hockey talent in our community. We look forward to working closely with Peter Schaefer and the entire Surrey Eagles organization."